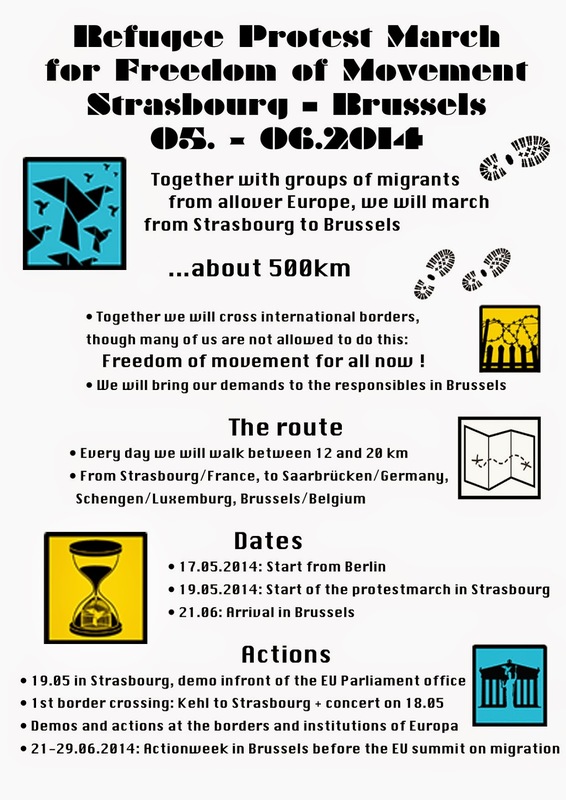 We come from everywhere to march from Strasbourg to Brussels. By jo 2. Karawane FlüchtlingsFrauenKonferenz, 20.06. “Flüchtlingsbewegung Sachsen-Anhalt”, The caravan for the right of refugees and migrant and The Voice refugee forum are organising a meeting with our fellow refugees in Burg Lager On 27.5.2014 in Jerichower land local government, Sachsen-Anhalt. Better to die fighting for freedom then be a prisoner your whole life. “It’s better to die on feet than live on knees”. Francis Kwame survived the NATO war in Libya, He was an active member of the group “Lampedusa in Hamburg”, but was denied and killed by the senate of Hamburg. He was traumatized and humiliated by the so called democracy in Hamburg…. Francis Kwame lives on in our struggle as witnesses of war for survival and the truth. “When exposing a crime is treated as committing a crime, you are ruled by criminals.” This is why we desperately need System change in Germany. Yet again, Mbolo Yufanyi is being tried in the German courts, this time in Dessau. By thevoicejena “Wenn die Aufklärung über eine Straftat selbst wie eine Straftat verfolgt wird, dann werden wir von Kriminellen regiert.” Deswegen brauchen wir dringend einen Systemwechsel in Deutschland. Refugees regret and mourn the death of Francis Kwame and criticise the German executive and judicial organ in charge of refugees affaire. We regret and mourn the death of our fellow refugee Francis Kwame in Hamburg. This is one of the outcome and evidence of stats repression, injustice, discrimination, war in Libya. We didn’t survive NATO war in Libya – to die in the streets of Hamburg! Francis Kwame , according to the information, had survived war in Libya, where he had lived and worked for almost 20 years . Lost all he had worked for so many years, obliged to quit Libya to exile, to protect his life in Europe. Flüchtlinge aus Jena kontrollieren am 20. April die Polizei in Jena und fordern eine Entschuldigung! Wir sind eine Gruppe von Flüchtlingsaktivisten aus Schwäbisch Gmünd. Wir erklären hiermit explizit, dass wir uns von niemandem von unserem Recht auf unseren politische Entfaltung abhalten lassen werden. Refugees from Schwäbisch Gmünd control the police in Jena! We are a group of refugee activists from Schwäbisch Gmünd and we make sure no border can stop our activism. On April 7, 2014 a trial took place at the Hamburg district court because of supposed trespassing. „End to the ignorance – Recognition of the group Lampedusa in Hamburg – for a life in dignity“ was written on banner with which some people entered last june the townhall. The trial began after changing in a bigger room with a declaration of the accused. By a projector a video was presented from the new youtube channel „witnesses of war“: http://www.youtube.com/watch?v=sKtSN-z2dgo. In this video two speakers of the group „Lampedusa in Hamburg“ talk real regarding their situation and who is responsible. Listening to this video is a precondition for the following statement argued the accused against the attempt of state persecutor and judge to prohibit the showing. On April 28 the case will prusued. To the specific allegation that was made against me and three other people, one can only say that it is a false accusation. There was a discussion and an agreement, afterwards nevertheless the other side was pressing a charge. Israel will pay for the crimes committed to Africans from The VOICE Refugee Forum Network on Vimeo. Activists of The VOICE Refugee Forum, The Plataforma for Refugees and Migrants and The Caravan for the rights of Refugees and Migrants (Germany): Mbolo M.Yufanyi and Mai Zeidani Yufanyi together with some African activists in Israel/Palestine attended a Picket at the Apartheid “Open” Prison in Holot in the Negev desert (South of Israel). 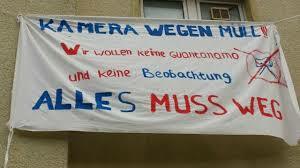 Deutsch: Hören Sie auf uns mit Ihrer Kamera nach Guantanamo-Methode auszuspionieren! Police Brutality with dogs and Pepper spray as Refugee protest continues against CCTV in Schwabisch Gmünd. We are Refugees and not prisoners who Mr Betz should spy on 24 hours daily. Our resistance is aimed at liberating you and those fellow refugees who has been kept under constant fear of liberating themselves from your propaganda. We are calling on members of OSTALB LANDKREIS to address the repressive attitude of Mr Betz and his folks and bring their old fashion culture of racism and dictatorship to order.